Why Are Waiting Room Magazines Always So Old? 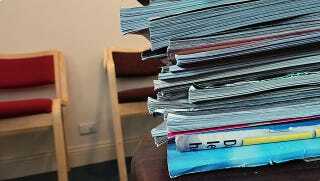 Have you ever noticed that most of the magazines in your your dentist's waiting room are old? A new study, published in the British Medical Journal, explains why. 28 of these 47 (60%) magazines and 10 of the 35 (29%) older magazines disappeared (P=0.002). After 31 days, 41 of the 87 (47%, 95% confidence interval 37% to 58%) magazines had disappeared. None of the 19 non-gossipy magazines (the Economist andTime magazine) had disappeared compared with 26 of the 27 (96%) gossipy magazines (P<0.001). All 15 of the most gossipy magazines and all 19 of the non-gossipy magazines had disappeared by 31 days. The researchers conclude that the preponderance of old magazines has more to do with the disappearance of magazines than the supply of old ones. Based on this evidence, and the observation that gossip magazines tend to disappear the quickest, the team advises "practices to supply old copies of non-gossipy magazines." "A waiting room science curriculum," the researchers conclude, IN ABSOLUTE EARNEST*, "is urgently needed." *It bears mentioning that the study appears in the BMJ's Christmas issue, which, while still peer-reviewed, has more... lenient admission standards than usual.